Liquid corn gluten works just as well as traditional weed control products. But it’s also safe to use around your children and pets because it’s just the by-product of corn milling. There are no synthetic chemicals in corn gluten. And yet, it’s a powerhouse not only in preventing crabgrass and other grassy weeds but also a wide variety of broadleaf weeds as well. In this blog, you’ll learn more about liquid corn gluten, its benefits as a safe weed control product and why you need Lawnmark Plus to provide your lawn with this weed control product. Although the by-product of corn gluten is a dry powder, it’s not as effective as liquid corn gluten due to the high amount of nitrogen that’s in the powder form. Matter of fact, the powder form has 10% of nitrogen. The high amount of nitrogen in powder corn gluten will feed both your lawn grass and the weeds that exist in your yard. However liquid corn gluten only has 1% of nitrogen, making the product a perfect solution as a pre-emergent weed control product. Lawnmark Plus uses a concentrated form of liquid corn gluten that has this low percentage of nitrogen. So, it won’t be feeding the crabgrass and other grassy weeds that you want to prevent from sprouting in your NH lawn. Liquid corn gluten is applied to your lawn in early spring—around the time the forsythia bush starts blossoming. The product will form a barrier in the soil to prevent crabgrass from germinating. Crabgrass doesn’t develop its roots right away. Instead, the plant’s shoots pop up through the ground before the roots are developed in the soil. Liquid corn gluten, like synthetic weed control, forms a barrier between the soil and the weed’s root system. It basically stops root development from starting which leads crabgrass shoots to die. And many other types of weeds. While liquid corn gluten makes a wonderful form of weed control, it does take someone who understands how much should be applied in order to be effective. 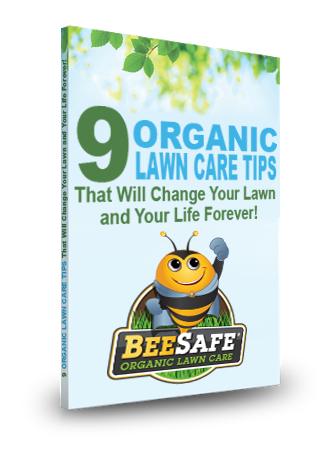 And not all organic lawn care products are the same. Instead, you need someone who understands organic lawn care and gets the right brand of liquid corn gluten. At Lawnmark Plus, we’ve studied and tested many different organic weed products to make sure you get the results that we promise you. Our liquid corn gluten is low in nitrogen. So it’s not going to encourage weed growth. Instead, you’re getting a natural product that will kill your weeds. So, if you’re looking for an organic lawn care company that will apply liquid corn gluten to your yard to prevent crabgrass, call us today at 603-262-1215 or fill out our contact form. Lawnmark Plus serves all of Southern New Hampshire & Northern Massachusetts.